The robust design and wear-resistant materials make the EXTRU indispensable for extrusion. It can also be used to transport natural rubber and soft PVC through different special designs. The WITTE fast-changing color design is perfect for master batch applications with frequently changing colors. The extrusion gear pump is mainly used in connection with extruders or kneaders. They lower the naturally existing pulsation and uneven transportation, particularly of single-screw extruders. 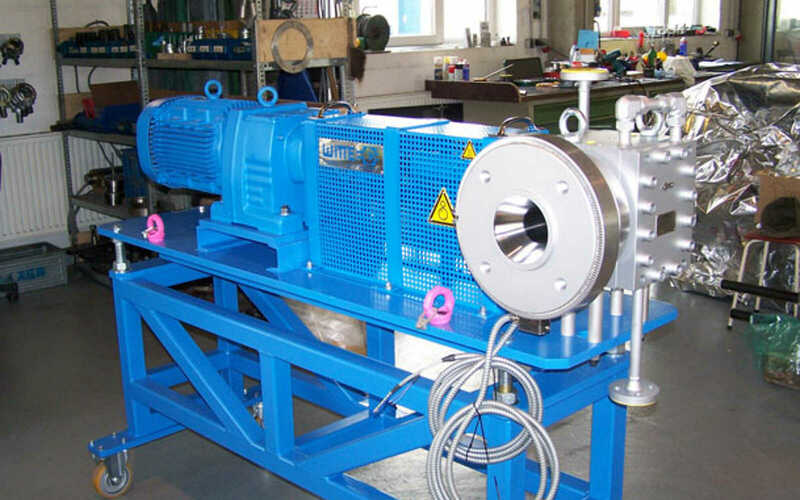 The extrusion pump is also used as a melt pump. It takes over the establishment of the required transport pressure, which is needed for the downstream equipment. In the gear pump, the pressure build-up occur significantly more efficiently than in the extruder itself. The extruder is relieved through the use of an extrusion pump. Significantly less energy or heat is added to the polymer. The melt pump thereby contributes to the gentlest possible transportation. The EXTRU pump is indispensable for the production of precise foils or micro-granulate. Please fill out the following form so we can create an offer that is exactly customized to your needs. One of our sales engineers will examine your request and contact you to discuss your personal solution. The casing can be heated electrically. A separate cover heating is also possible. The threaded shaft seal can be equipped with a cooling unit to increase viscosity. A “bleeding bearing” variations is available for particularly sensitive media. The bearing lubrication flow is guided outwards so that any stressed material is not returned to the main flow. The housing may be designed in different variations. A round and a square design are available as standards. But customized designs are also possible. A version for fast changing colors is optional as well. 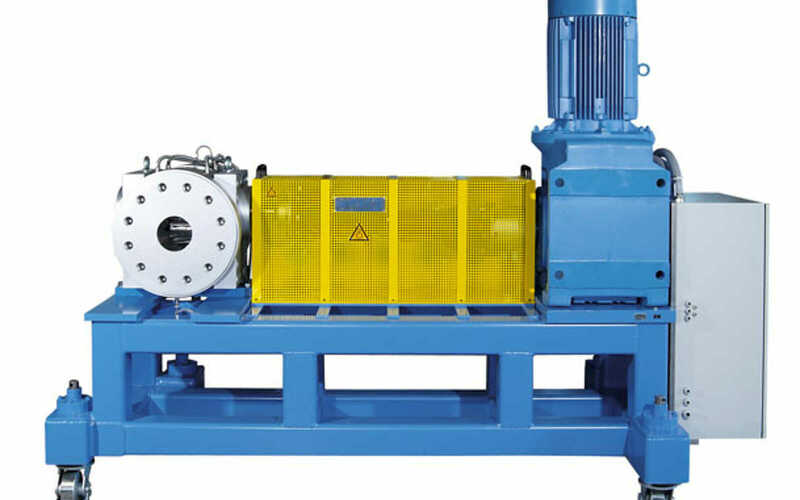 To prevent the drive shaft of the pump being driven/pushed out of the casing with high pressure on the suction side (flow pressure of the extruder) the drive shaft must be relieved. It is guided out on both sides of the casing and sealed so that atmospheric pressure is present on both sides of the drive shaft. The shaft runs with relief. 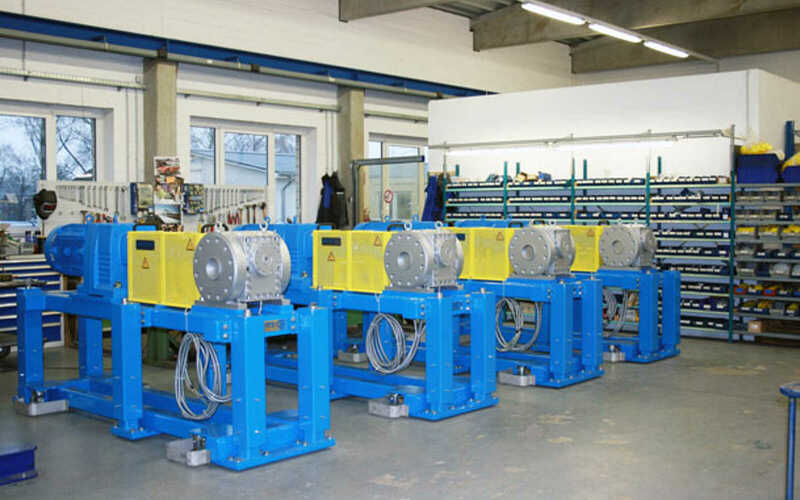 We offer a special gearing for the EXTRU melt pumps for particularly sensitive media. The herringbone gearing reduces the natural pulsation of the extruder and guarantees a constant melt flow. From 4,7-22-22 (4,7 cm3/U – 10 kg/h) to 12.000-280-280 (12.000 ccm/U). Sizes with smaller gears for higher differential pressures are possible, p.e. 690-140-90.